Out of town on business and in need of a quick pick-me-up, I wandered into a blow-out salon in Washington, D.C., last year. 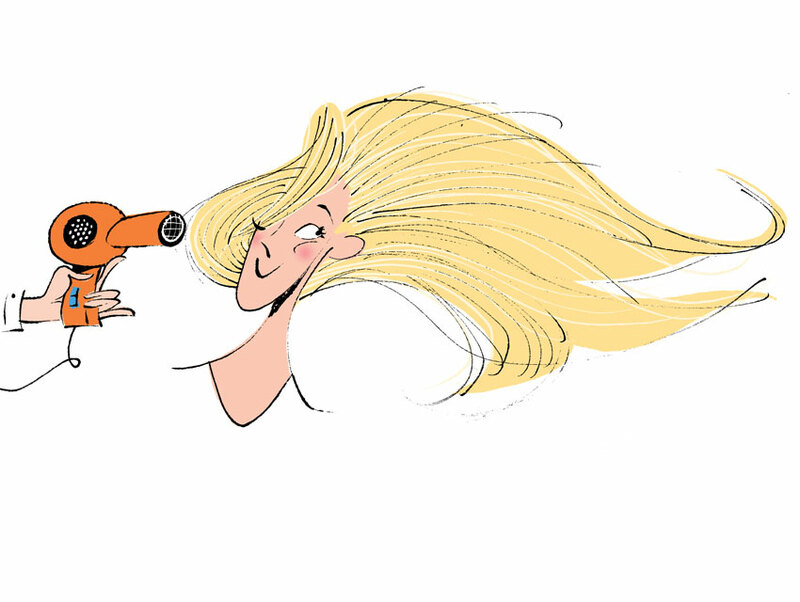 The service I sought—a stylist washing and blow-drying my hair—cost $40. There were flutes of complimentary champagne at the ready and Hollywood Regency chandeliers overhead. Something starring Ryan Gosling flickered on the TV screen. As I sat in a swivel chair, catching up with People magazine while a stylist worked her magic, I couldn’t help feeling as if this were a déjà vu moment. Why? Because I’m a habitué of Drybar in Los Angeles. Drybar wasn’t the first salon to offer express blow-outs, as you’ll learn in this month’s Business column by Monica Corcoran Harel, but it had the shrewdest game plan. The company’s approach has been replicated in salons across the country, down to free champers and rom-coms on the telly. Founded by Alli Webb and her brother Michael Landau in Brentwood in 2010, Drybar has grown to 38 locations and brings in $50 million a year. Webb has set the industry standard for the price of a blow-out; I recall ducking into a salon in New York in the days before Drybar and forking over more than $100 for so-so results. The company’s assurance that customers will be in and out of the buttercup yellow salon in about 45 minutes, for only $40, has drawn everyone from teens primping for the prom to studio executives looking for twice-weekly mane maintenance. Los Angeles is filled with visionary entrepreneurs. I recently had breakfast with one of them: Jane Wurwand, the founder of Dermalogica. She told me that her company wouldn’t have succeeded had she launched it anywhere other than in L.A. (especially her native England). We agreed that the anything-goes ethos here encourages a lack of self-censorship, be it in the fields of business, style, or the arts. No judging, no “You’ve got to be kidding me” responses to ideas. Just run with them. Reading through our April issue, I thought about how that attitude permeates so many of our stories. It’s the engine fueling the rise of Panda Express, the most successful Chinese quick-serve chain in the country, which opened its first outlet at the Glendale Galleria in 1983. It’s embedded in the recollections of actress Freida Pinto, who’s featured in this month’s L.A. Story. It informs the surprising saga of a house built by the Craftsman masters Greene & Greene in Hollywood in 1904, only to migrate piece by painstaking piece to remote Canada in 1917. It’s behind the singular style of our cover subject, comedian Sarah Silverman, who kicks off our “How to Dress in L.A.” feature. In every issue we celebrate the notion that any promising idea can succeed here. If you’ve got big enough dreams and sharp enough business acumen, Well, who’s going to stop you?